Send flowers basket with Orchids ONLY in Kiev | Order online with regular discounts. This flowers basket is not only an exclusive offer from Kiev florists. It is an elegant gift for a truly special occasion. Gift smilies for someone You love. Let their house will be filled with an incredible aroma of orchids and chrysanthemums! Flowers basket size: 65х65 cm. 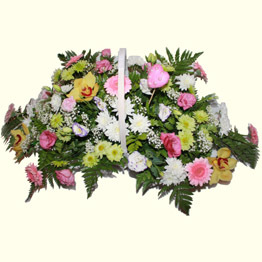 The Basket of orchids and chrysanthemums will be delivered to the Recipient within 24-48 hours after ordering online. Free sweets and greeting cards for every order of more than $100.